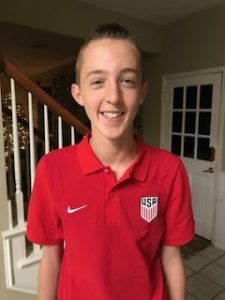 The club is very proud to announce that Gabriel Hull, South 02 Boys Orange has been selected for the Paralympic National Team Training Camp in Chula Vista, CA. After many years of recreational soccer, Gabriel is currently in his third year of competitive soccer with the Houston Dynamo | Dash Youth Soccer Club and is currently coached by Armando Badillo and Jorge Escobar. “It’s a really cool opportunity for me to go and train and maybe make the national team one day. I’ve been working hard with the competitive Dynamo teams the past few years and I’m looking to get even better working with Coach Sharp and the rest of the National team staff and players.” Gabriel Hull, Dynamo South 02 Boys Orange. “Gabriel works constantly with other players to improve and compete with great discipline and commitment. Gabriel plays at his best constantly and is an inspiration to coach” David DeVerteuil, Assistant Executive Director, HDDY South. “I am really happy for Gabriel, his attitude on and off the field is always great. He has worked hard for this opportunity and continues to work hard every day to become the best soccer player he can. I’m really proud of him as a coach and I know he will do great!” Jorge Escobar, Youth Academy Director South.